Wenatchee River County Park is centrally located in the very middle of Washington on Highway 2 and the Wenatchee River. We are in a town called Monitor just between Cashmere and Wenatchee. We are listed in Trailer Life Magazine, as well as, Woodall's with exceptionally high ratings for a County Park. We strive to give the very best of attention to our guests by keeping our facilities to a high degree of cleanliness. In our park, we have many amenities that are for our guests' use, as well as, an abundance of beauty surrounding us. We are also only a few minutes from Wenatchee, Cashmere and approximately 15 miles from the wonderful Bavarian town of Leavenworth. 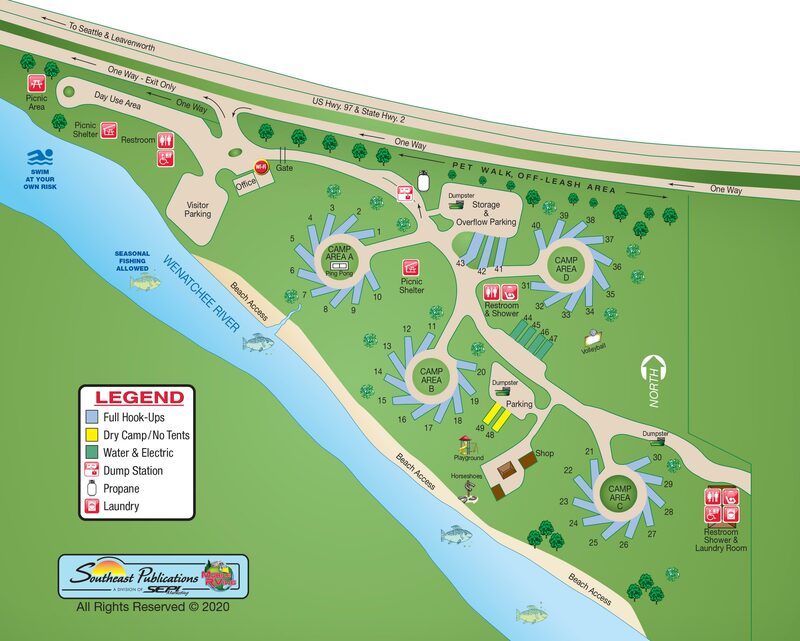 Our park boasts 49 spacious sites, which includes 3 Pull-Thru, 4 Water & Electric, and 2 Dry Camps sites. (No Tent Camping) 43 of our sites are full hook-ups that include water, electric, and sewer. ** Reservation starts January 1st and must call the office for reservations! Extras: +$5 fee for additional person per night. +$5 fee for additional vehicle per night. We are an RV Campground so no tents are allowed in the park. This is due to the fact that we take pride in our beautiful green grass, so we do water nightly. Our amenities include: Laundry facilities, showers, restrooms, sand filled volleyball court, horseshoes, golfing cage, basketball hoop, free movie usage, books to read and a small Workout Center. For the kids we have a playground area and a swing set. We have also added an outdoor Ping Pong Table and outdoor workout center. Don't forget we have free Wi-Fi so be sure to bring your laptop. We have plenty of riding areas for your bicycles. We have a post office, small store, and a restaurant within walking distance. If you are an antique buff you are in luck as we have acres of shops just a few minutes from us. If you are a wine connoisseur there are many wineries in the area for you to enjoy. We are Pet Friendly. Please be sure to pick up your pet's waste. We are open from April 1st - Oct. 31st. Our office hours are from 9:00 AM to 9:00 PM. After Labor Day we close at 8:00 PM.